PHOENIX — This nightmare season started in Arizona with a blown save. Wednesday’s result, then, was rather appropriate. Sam Dyson blew a two-run lead in the bottom of the ninth and the Giants fell 4-3 to the Diamondbacks in their final road game of the year. The implosion cost Jeff Samardzija his 10th victory on a day when he threw six strong innings and benefited from three early runs. Dyson opened the final frame by giving up a leadoff homer to J.D. Martinez, who hits one just about every day now. Joe Panik stole one out with a nifty throw to the plate, but the Diamondbacks loaded the bases and tied the game on a fielder’s choice grounder. Dyson then walked in the winning run. Samardzija's final numbers: Samardzija’s second season with the Giants: 32 starts, 9-15, 4.42 ERA, 1.14 WHIP, 205 strikeouts, 32 walks. He walked off the mound ranked first in the National League in innings (207 2/3) and sixth in strikeouts. If you look at his FIP (3.60) or xFIP (3.60), Samardzija probably deserved much better this season. Outfield defense, you know? 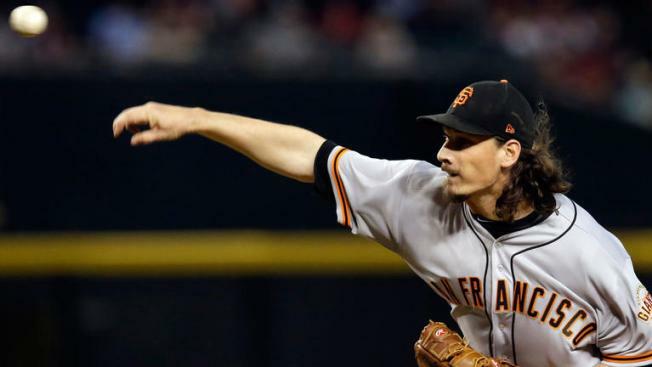 Samardzija makes franchise history: Samardzija finished the year with a 6.41 strikeout-to-walk ratio, the best mark by a starter in San Francisco Giants history. Juan Marichal (6.17 in 1966) held the previous record. Frequent flyer miles: Jake Lamb’s solo shot in the fifth was the 30th off Samardzija this year, a career-high. He allowed 29 in 2015 with the White Sox and 24 last season. Samardzija became the fourth NL starter to allow 30 in the Year of the Homer, joining John Lackey, Gerrit Cole and Julio Teheran. Bad break? Mac Williamson got hit by a pitch in his second at-bat but stayed in the game and drew a walk. He was replaced by Gorkys Hernandez a couple of innings later. Any injury would be a brutal break for Williamson, who is hoping to play winter ball.